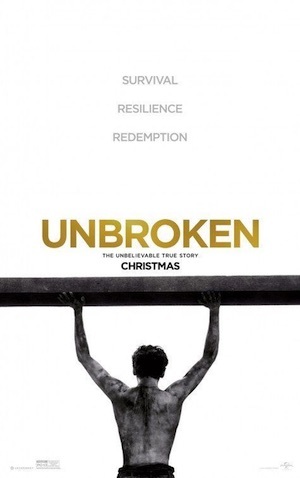 Originally released as a book, Unbroken is a movie based on the life of Louis "Louie" Zamperini. A former USA Olympic track star and World War II prison of war, many have likely heard the tale of Zamperini, but for those that like to go into a movie fresh, be aware that the basic plot may be revealed below. 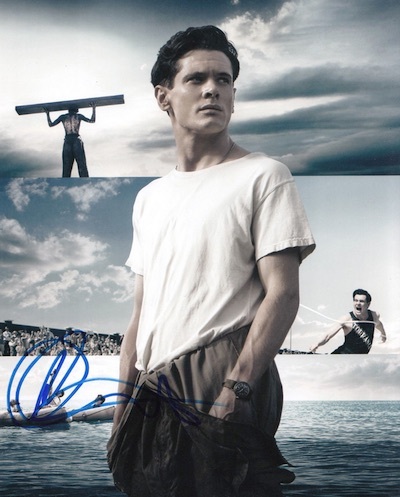 The following guide looks at some of the collecting options for Louis Zamperini and for the theatrical release. , which also spawned a movie. Angelina Jolie was chosen to direct Unbroken and the screenplay came courtesy of the Coen brothers, Richard LaGravenese and William Nicholson. The movie debuted on Christmas Day and despite mixed reviews, posted the third-biggest Christmas haul in history with nearly $16 million. Without getting too much into the details, Louie Zamperini first made his name as a member of the United States' 1936 Summer Olympics team. The games were based in Berlin, Germany, and he finished eighth in the 5000-meter race. After a standout collegiate career at the University of Southern California, Zamperini enlisted in the United States Army Air Forces. 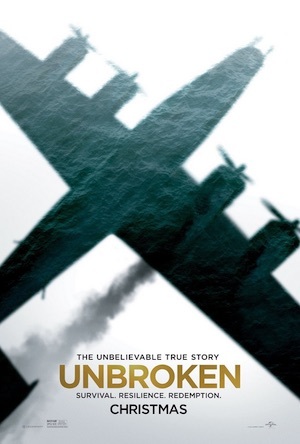 While conducting an air search for lost aircraft and crew, the plane that Zamperini was on crashed into the ocean and he was stranded at sea for 47 days before being captured by the Japanese Navy. 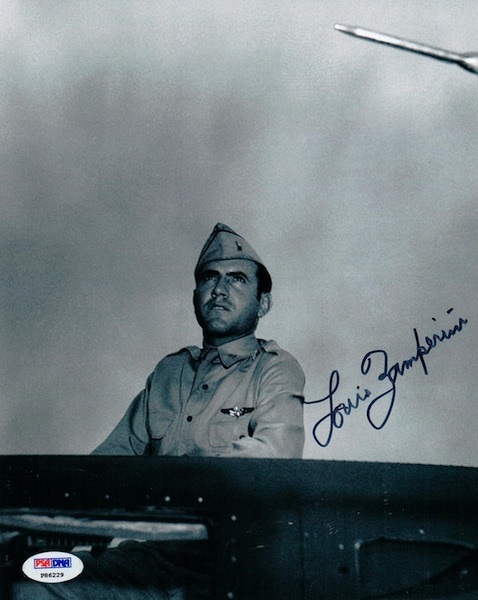 Louis Zamperini was a prisoner of war for over two years and subject to considerable abuse before eventually being released. He returned home as a hero and later became a motivational speaker. Zamperini passed away in July of 2014. 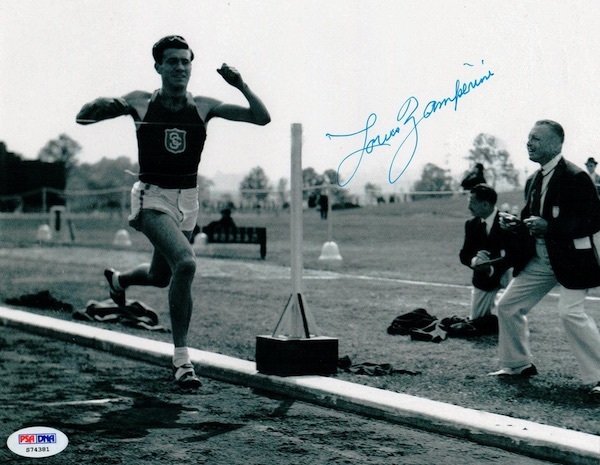 From a collecting perspective, there are not a ton of options available for Louis Zamperini, but his signed photos from his military and track career are the most popular along with autographed copies of his biography. 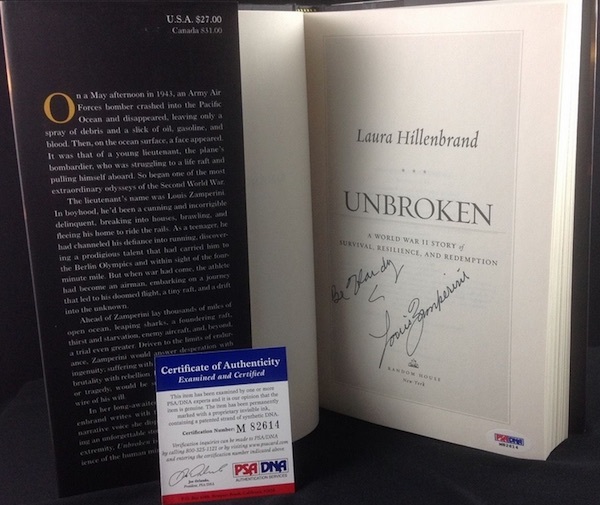 In addition to the signed pieces for Louis Zamperini, Unbroken offers several other options that center around the movie. First, there are movie posters for the film, some of which are signed by various people associated with the movie, including Angelina Jolie. While none of the cast would fall in the A-list category, Jack O'Connell holds the main role as Louis Zamperini and you might know him from his role on the television series Skins or as Calisto in 300: Rise of an Empire. Garrett Hedlund of TRON: Legacy fame is also in the film.